146. The State of the Sector study looks at many different dimensions of water and wastewater services; those are discussed in details in each of this report’s chapters. In the concluding part of the report, the team consolidated those various dimensions into an overall services sustainability assessment to evaluate how close each country was to being able to provide sustainable services for all. In that context, sustainability was understood to include access to infrastructure, quality of services provided, their efficiency, and the financing framework in place to provide financially sound yet affordable services. The services sustainability assessment combines those four dimensions and the underlying numerical indicators into an overall value. It is based exclusively on sector outcome indicators and does not consider the way the sector is organized or structured. 147. Services sustainability assessment construction. 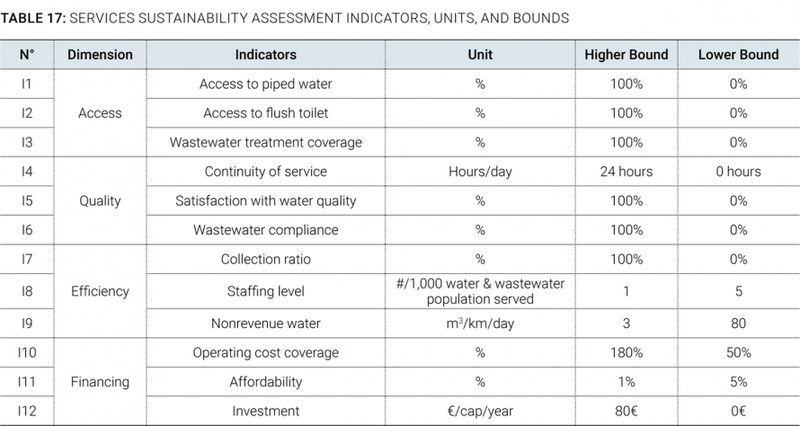 The services sustainability assessment was constructed from four dimensions (access, quality, efficiency, and financing), each measured through three indicators (Table 18). For each indicator, the regional best practice value (higher bound) has been defined by using expert opinion and analysis of the existing data (see Table 17); the lowest bound has generally been defined as the lowest possible value. The sustainability of a particular country is then assessed on the basis of a linear relationship between this lower and higher bound. Each indicator is weighted equally in the overall index calculation and simply added to obtain the overall value. 148. Assessment in case of missing information. For some countries, not all 12 indicators are available. When a given indicator is missing, its value is assumed to be the average of all the other indicators. However, all countries have at least 75 percent of the necessary information available, and most have 100 percent. 149. Assessment robustness and validation. 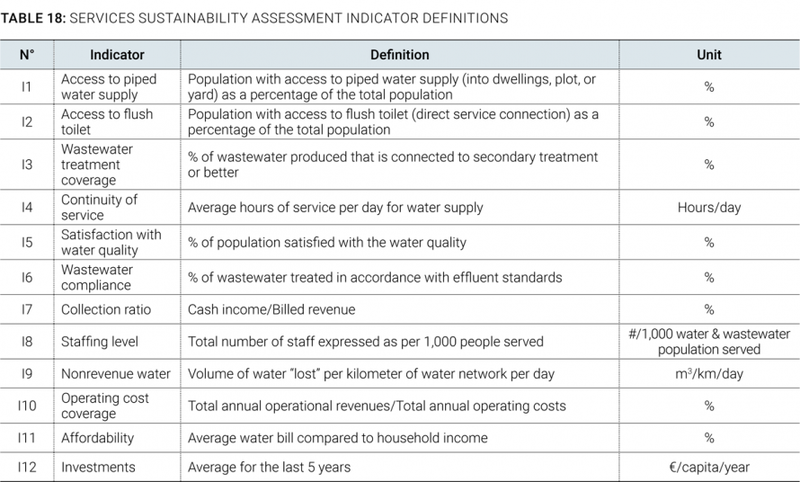 The water sector assessment is a simple aggregation of the sector outcomes along different dimensions. An extensive review of similar aggregated assessment initiatives, such as the World Bank’s Doing Business, the Transparency International Corruption Perception Index, the Gallup Well-Being Index, or the Times’ World University Rankings, was conducted prior to developing the proposed services sustainability assessment. Many if not most of those use simple additive aggregation methods and simple weights. As a consequence, the sustainability assessment is aligned with international practices, and its simple and transparent construction ensures easy understanding and replicability. At the same time, it is clear that any such effort will have limitations in terms of the comparability and oversimplification of policy messages; for example, countries facing significantly higher rural population, such as Moldova or Romania, are somewhat penalized because of the usually much lower level of piped water in rural areas.